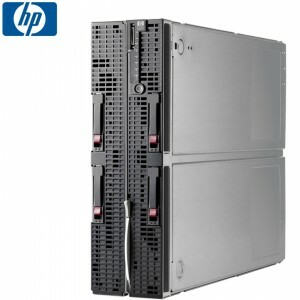 The HP ProLiant BL680c G7 delivers maximum performance and unparalleled scale-up expansion never seen before in a four processor x86 Server Blade, creating a powerful database engine, alongside handling the most demanding virtualization, database, rendering and dynamic computing workloads. Optimised for the Intel Xeon E7-4800 and E7-8800 processors and fully utilizing the design architecture of the Intel Xeon 7500 chipset. Up to four 10-core top performing 130W Intel Xeon processors are supported along with 64 RDIMM slots creating the first blade server to offer an impressive 2.0TB of memory. With 4 2.5” (SFF) hot-plug SAS/SATA HDD/SSD bays support up to 4.0TB of storage, powered by a high performance Smart Array P410i RAID controller. Six embedded NC553i 10Gb Converged Network Adapter ports deliver ample bandwidth for network intense applications with up to 24 connections to network and storage without the need for add-in I/O mezzanine cards. Only at Bargain Hardware can you configure every aspect of this BL680c G7 to meet your price and performance requirements. From 2.5" SAS or SATA drives to an array RAM options, every option is available to customize your system for any task or environment.